This is a 1980s refurbished family bach not an immaculate second home. It is located on the beautiful South Coast location of Island Bay, directly across the road from the beach. We don't increase our pricing for high season or public holidays. It is priced for and ideal for families, with furniture and chattels to suit. There are great time wasting views of the Island Bay fishing boats and the beach which is directly across the road. Excellent safe beach for the kids to play on and swim and an aquarium also just across the road. Next to the beach is a park with a playground and free BBQ's to use. Good walking around the coast and on local tracks. 25 minute bus ride to Wellington city, so plenty of activities for adults and children! 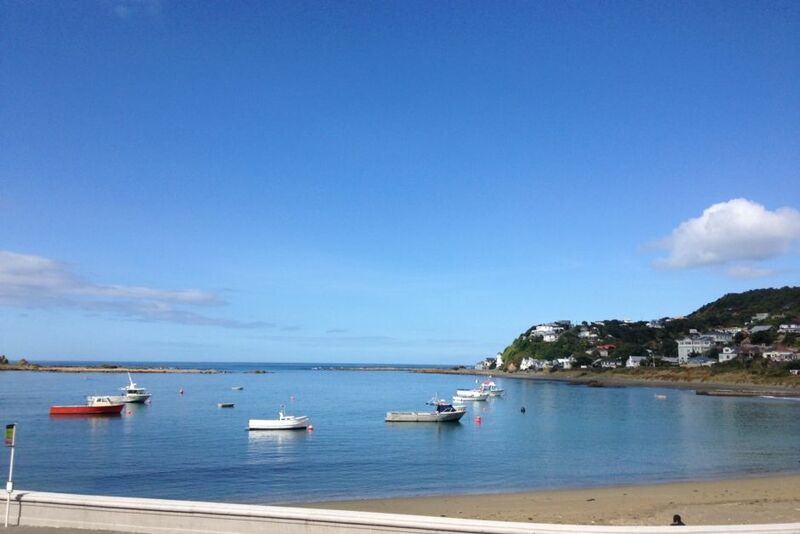 Island Bay Village is 15 minutes walk away which has a supermarket, The White Room gift shop, takeaway food options, post office, cafes, library, hairdressers and doctor. The Empire Cinema which is a 10 minute walk away, has had a recent art deco themed refurbishment with a restaurant, coffees and gelato and three cinemas. Wellington airport is a 15 minute drive around the bays. Comfortably set up with good beds - this is used as a bach for us out of town owners. We like to get away from it all so facilities are limited. There is no phone or internet access. Basic tariff is $130.00 per night for 2 adults. Extra adults $15.00 per night each. Pre-school and school children free. (you will need to negotiate this and providing your own linen with the owners as Homeaway does not allow for this.) There is an open staircase on one side to potentially watch for with very little ones (see photo). There is a garage for storage, but not for a car. Extra toilet at back of garage. Portacot available. Cars can be safely (so far!) parked outside the bach or more safely on the far side of the footpath across the road, by the sea wall - this can be seen in one of the photos. Owned by Margaret and Bryan. Smoking allowed outside only. Please put butts in rubbish. On street outside bach and across the road on the far side of the footpath. 4 electric hobs, oven and warmer. Beautiful place to stay. Amazing views and a comfortable space. Would definitely go back. Easy access. All amenities were available and fantastic. Host was quick to respond with any questions. Thanks! This property was very homely and well suited for an elderly father and son, perfectly. Although not new, it had everything we needed. The floor plan worked perfectly. The view was spectacular. On site parking was limited but was not a problem. There was adequate within the environs. We took the bus into town several times. The bus stop was within easy walking distance. Restaurants and grocery stores were nearby and easy to find. We wish, we had spent more time a the shops in the Island Bay neighborhood. If we were acceptable tenants, we would like to stay there on future trips. Very cosy, cute home! Lots of space for our family of 3 adults and 2 kids. Beautiful views. Was even better than what is in the photographs. Will definately stay again next time in Wellington. Very good location- beach is literally across the road, park close by for the kids. The house had everything we needed for our stay. Thank you! Great place, comfortable stay and a beautiful view!